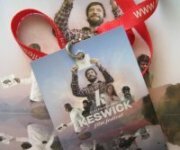 Archive: Keswick Film Festival - Feeling Good? Is it possible to make a film about life threatening or life changing (like Alzheimer's) illness without it being mawkish or intrusive into peoples' privacy? We think we have found some that challenge and bring into the open situations that deserve greater dignity. Adapted from Sally Nicholls’ novel, Ways to Live Forever is a touching and inspiring film about 12 year old Sam, played by Robbie Kay. Sam is the narrator of the film, through the medium of his video diary. He reveals much about himself, when while making a list of important things about himself, the fact that he is dying of leukaemia merits only 4th place. He loves facts, he wants to know about UFOs and horror movies and airships and ghosts and how it feels to kiss a girl. He wants to know the facts about dying.Sam needs answers to the questions nobody will answer. Also starring Ben Chaplin, Emilia Fox and Greta Scacchi, Ways to Live Forever has been an official entry in the Amsterdam, Tallinn, Terra di Siena and Indianapolis Festivals. The film takes place almost entirely on a property in the cane country of northern New South Wales, where single mother Rhea (Emily Barclay) survives by barring the door against debt collectors.To help make ends meet, she agrees to find room for Doyle (John Hurt), an old sailor with Alzheimer's disease who is the paternal grandfather of her three young daughters - an exotic figure in this setting, with his faraway eyes, English accent and sensitive, ravaged face. The oldest girl, Lou (Lily Bell-Tindley), initially resents the newcomer and the painful memories he stirs up. Doyle confuses the 11-year-old Lou with the wife who broke his heart many years ago, and Lou soon finds her own reasons to restage the past. This is a slightly dangerous coming-of-age fantasy. This session also includes a screening of Elfar Adalsteins’ Sailcloth staring John Hurt and among the short films tipped to land an Oscar nomination. Inspired by the real-life experiences of screenwriter Will Reiser, director Jonathan Levine's 50/50 is the story of a 27-year-old cancer patient's battle to beat the disease with the help of his friend. It has received strong reviews and – unusually for a comedy – is considered an outside bet for an Oscar nomination next year.Joseph Gordon-Levitt plays the somewhat portentously named Adam Lerner, a young writer working for a National Public Radio station in Seattle, who is told out of the blue he has spinal cancer with a 50-50 chance of recovery. He gets along with a little help and hindrance from his friends, family and fellow patients, and the movie and Adam himself treat his situation with considerable humour.